"This gives us a lot of confidence for the future, we can be really proud, there has been incredible fight and we have shown that we can play great football," Netherlands coach Ronald Koeman told NOS. "I really see a great future for Dutch football. Everyone needed this, the players, the staff and the whole of the Netherlands." Koeman handed debuts to PSV Eindhoven duo Denzel Dumfries and Steven Bergwijn while Germany gave a first cap to forward Mark Uth who plays for Schalke. Teenager Matthijs de Ligt was inches away from connecting with a Depay cross before the home side took the lead. Ryan Babel's header from a corner crashed against the crossbar and Van Dijk converted the rebound. Substitute Leroy Sane, controversially left out of Germany’s World Cup squad and with much to prove in a national team jersey, was played into acres of space in the box but fired wide when he looked certain to score his first international goal. 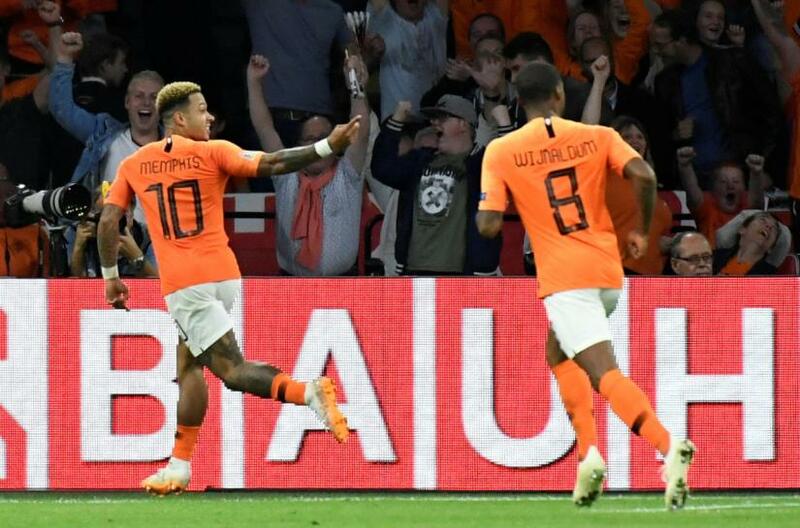 The Dutch had to soak up pressure and looked to hit the visitors on the break -- something they managed on repeated occasions -- but both Depay and Wijnaldum drew blanks, when the former's effort was saved by Manuel Neuer before Wijnaldum shot wildly over the bar with just the keeper to beat. "We played OK until we conceded and then did not use our chances," Loew said. "After conceding, you could see that recent results have led to a lack of confidence. Why are we not scoring? That’s difficult to answer, we have clear chances. "Had we lost 1-0, it would have been acceptable but breaking apart like this in the last 10 minutes is not good."